Sciatica is a common and extremely painful debilitating condition, typically characterized as lower back pain in conjunction with radiating pain down the back of one’s leg. It is most commonly described as a burning sensation, or it can feel like electric shocks running down the back and side of the leg. It is also often associated with numbness or pins and needles down the leg. The associated pain is often concentrated in the buttocks and the back of the thigh but in many cases the pain will travel down the leg and into the foot. Compression of the the sciatic nerve may also manifest as weakness in the leg and foot. The most common cause of sciatica is a bulging or a herniated disc at the base of the spine, typically at the level of the L5-S1 nerve root. If there is a disc injury, the gel-like substance inside the disc (called the nucleus pulposus) can escape from the disc and put pressure on the sciatic nerve, causing pain down the leg. Sciatica can be caused by an acute injury, such as lifting a heavy object with improper technique, however it most often develops gradually over time. Sciatica can stem from pressure on the sciatic nerve from the bones of the spine, which is generally described as osteo-arthritis. Other common terms used to describe this condition are degenerative joint disease (DJD) or degenerative disc disease (DDD). As we age, the discs can lose their height and become thinner, thereby reducing the size of the space that the nerve root can travel out from the spinal canal. 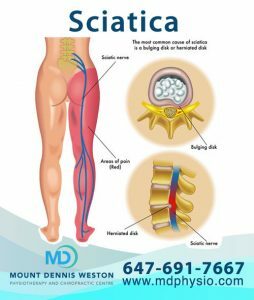 Sciatica can also stem from the narrowing of the inside of spinal canal due to age which is called “spinal stenosis.” Spinal stenosis is more common in people aged 60 years old and above. Another common cause of sciatica is known as “Piriformis Syndrome.” This is caused by tension of the piriformis muscle, which is a small muscle located in the buttocks region. The main function of the piriformis is to rotate the hip outwards (external rotation). 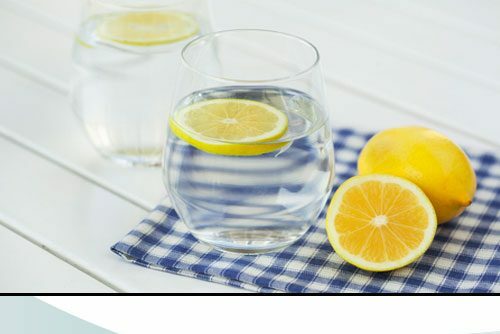 It can become chronically short and tight with prolonged sitting and can irritate the sciatic nerve most often with people who sit a lot at work, either at a desk or with prolonged driving. Sciatica can also arise during pregnancy. With weight and hormonal changes in the body, the pelvic bones and muscles start to shift with natural weight gain. As the centre of gravity starts to shift, it is common to develop pressure on the sciatic nerve. Many times this condition this condition will resolve itself and dissipate following pregnancy. Predisposing factors for developing sciatica are often being overweight and / or being a smoker. Smoking can increase the risk of disc injury as a result of less oxygen in the blood stream. Those who do a lot of repetitive bending and lifting with poor technique are also at a higher risk of disc injury. Spinal decompression therapy: Decompression therapy is often the treatment of choice for sciatica. A spinal decompression table is designed to target the precise level of the nerve impingement and it uses computer-controlled tension to decompress the discs. This allows for relief of pressure off the nerve. Decompression of the disc allows for more blood, oxygen and nutrients to flow to the disc and promotes healing and pain relief. Chiropractic: Chiropractors can help relieve sciatica with gentle chiropractic adjustments and soft tissue therapy to restore normal biomechanics in the spine, removing pressure off the sciatic nerve and decreasing muscle tension. In some cases, one chiropractic adjustment can cause immediate relief. Acupuncture: Acupuncture provides symptomatic relief for sciatica and can decrease pain, tingling and numbness down the patient’s leg by stimulating the muscles and nerves that are affected. It also works by decreasing local inflammation at the site of the disc and the pinched nerve. Physiotherapy: Physiotherapy works to decrease pain and increase proper movement in the lower back, hips and legs. Exercises will be prescribed to decrease pain and improve posture. Most exercises will aim for extension of the spine to reduce pressure on the lower spinal discs. Laser therapy: Laser therapy can help heal disc injuries and muscle spasms by using natural light energy to promote healing on a cellular level. Laser therapy helps with both pain management and it speeds up the healing process, and the treatment itself is pain free. Massage therapy: Massage therapy decreases pain by releasing tight and tender muscles that may be in spasm in conjunction with sciatica, most commonly the lower back erector muscles, the piriformis, the glutes, and the hamstrings. Education: Patient education is a key component to make sure patients understand how to move, bend, twist and lift properly to avoid a recurrence of sciatica. At Mount Dennis Weston Physiotherapy and Chiropractic Centre, we use a team-based tailored approach to assess, diagnose, and treat all symptoms and causes of sciatica. Our unique plan of management will utilize an integrated approach to treat sciatica and we will set up a long term plan to help avoid future recurrence.